Located south of Manchester, Bromley Mountain is best known for being home to Bromley Mountain ski area. Prior to the development of the ski area on the mountain's southeast face, there was a ski trail on its western side, which may have run from the summit to East Dorset. Circa 1935, John Perry, David Parsons, and Rolando Palmedo planned the "Bromley Run" via airplane. Located on the west side of Bromley Mountain, the run was likely cut in 1936 by Ralph Hutchinson and the Works Progress Administration (also known as the WPA, a sister organization of the CCC). Snow trains were planned for transporting skiers and spectators to the area, however due to a poor snow year, the trail like didn't open until late in the 1936-37 season. The run made headlines for being the site of the New York City Interclub championship race during its early years. At one point in the mid 1940s, Big Bromley ski area planned a new complex for the western side of the mountain, which would have included a connector trail from the Bromley Run. The complex was never developed. 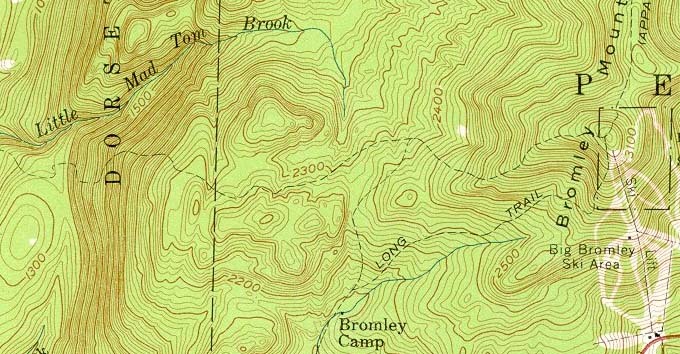 Bromley Run remained on Bromley ski area trail maps into the early 1950s before fading from memory.
" Bromley Run, planned from airplane by Perry, David Parsons, and Roland Palmedo, president of the Amateur Ski Club of New York, was cut the following Summer by the National Forest Service under the direction of Ranger Ralph Hutchinson. In the Fall, Fred Pabst and Seth Pollard, the ski-tow eperts from Wisconsin, set up their red and blue contraption on the eastern slope of Mount Aeolus, and the railroads decided to run three New York snow trains to Manchester. The trains never ran, because there was no snow until alte in the Winter, when New Yorkers were buying their Spring clothes. " " The old Bromley run from the mountain summit, scene of the New York City interclub championship race, still makes a thrilling novice-intermediate descent. From the summit of 3,200-foot high Bromley one gets a remarkable view of Winhall Valley, Pennington Valley and the Adirondack and Presidential ranges. " " The run, which was opened the winter of 1936, ran down the west side of the mountain towards East Dorset and was actually constructed as a WPA project on National Forest land under Forester Ralph (Hutch) Hutchinson. It became one fo the most popular racing trails in the East for several seasons and the New York City club championships were held on it. These were always downhill events, for slalom racing hadn't been developed in those days. " Dillmann, Mary. "Mancheser, 'Hub of Eastern Skiing,' Traces Winter Prosperity Back to '38." Bennington Banner. 4 Jan. 1962. Elkins, Frank. "Ski Slopes and Trails." The New York Times. 1 Jan. 1943. "Ski Trails and Tow Await a Freeze." The New York Times. 5 Dec. 1937.